Admit it, sometimes we love our pets more than we love people. Who can pass up a soft coat, energetic wagging tail, and those appreciative dog kisses? If you’re a pet lover, you know that no matter what kind of day you’ve had, when your loyal companion greets you at the door, life is better at that moment. There is a reason why they call dogs “Man’s Best Friend”. We adopt them into our families and they come along on family trips. We take them to the park, to the beach, on a hike, or even camping. On road trips, everyone piles into the car, including the dog. The memories we make with our pets last a lifetime unfortunately so does pet hair, dog drool, and doggie odor. 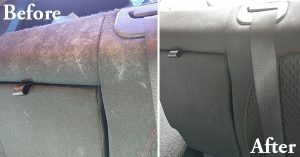 Removing pet hair from our cars can be a big pain in the you know what. The level of difficulty depends on the type of dog hair and the type of carpet fibers. Also, don’t forget the nose art or Snot Dots on the windows. Unlike regular grease and grime, drool and nose art is sticky, slimy, and just plain hard to get rid of. We’ve compiled a few tweezer-free tips to get rid of pet hair in your car and a few helpful suggestions to get your windows slobber free! Static is your friend: Inflate a balloon and rub it on your car’s upholstery to create static electricity. The static electricity will attract the pet hair. If that doesn’t work, try rubber gloves or a pumice stone. The pumice stone method is best when using fabric softener solution because it breaks any static bond in the flooring and loosens the hair. This also softens the abrasive quality of the pumice stone. Scrape the pumice stone across the fibers to loosen the hair. As the fur’s lifted and released, vacuum immediately before it settles back into the carpet. Minimize the amount of dog hair: The easiest way to minimize the amount of pet hair in your car is to brush your dog on a regular basis. Not only does this brushing remove dirt, debris, and dead hair from being tracked in your car, but it’s good for their skin and fur as well. Keep wipes handy: Since drool has a way of flying around the car, it would be helpful to keep a package of upholstery and window wipes handy. You can clean the nose art before it has a chance to dry and settle into the fabric and windows. Your dog wants to get dirty: Let’s not forget the dog odor! An outing wouldn’t be as fun for them without the mud, water, and the occasional romp in stagnant or rotting water. After a particular messy adventure, use a towel to wipe your furry friend down of whatever he/she collected. Once you’re back home, let the car completely dry before you try and vacuum. You can douse your car with an odor-eliminator, such as Febreze, or leave a box of opened baking soda in the car overnight with the windows rolled up. Preventative care is key: For ongoing preventative care, we recommend using a dog car hammock for frequent passenger protection. They fit most cars (standard & extra large sizes), are made of waterproof material, and adjust easily to seats. 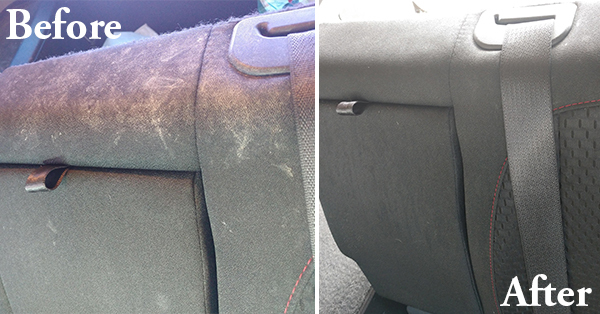 If it’s been a while since you’ve removed dog hair from your car, come by any one of our Sunset North Car Wash locations and ask for our Pet Hair Removal Estimate. The task to remove embedded dog hair is time-consuming and rather tedious. It takes time and care to ensure the carpet material is not damaged while scraping the embedded hair. As car fibers are wound so tightly, if it’s not done correctly, the material can fray, snag, and pull. You will want to set aside a couple of hours for a thorough cleaning, then aim to be more diligent in the future. If you do not want to deal with that stress, we encourage you to drop off your vehicle and go about your day. We’ll take care of the mess and return to you a Happy Car!